We’re always eager for something a little different in the realm of retail. Whether it be a nonstandard site floorplan, dated or unique decor, uneven mix of stores, it catches our eye. 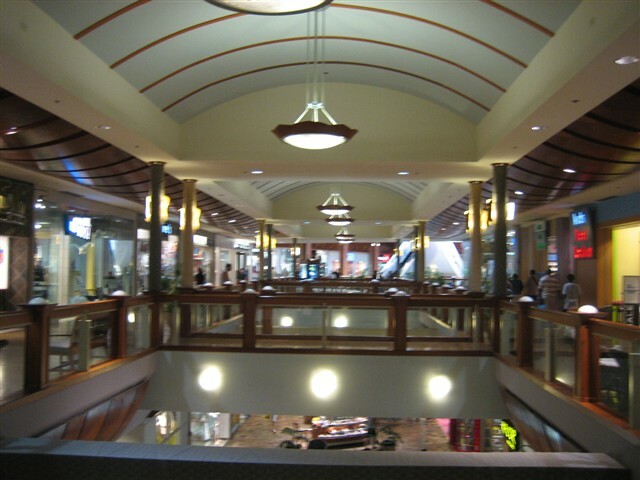 The largest enclosed mall on the island of Oahu in Hawaii is one of these situations. 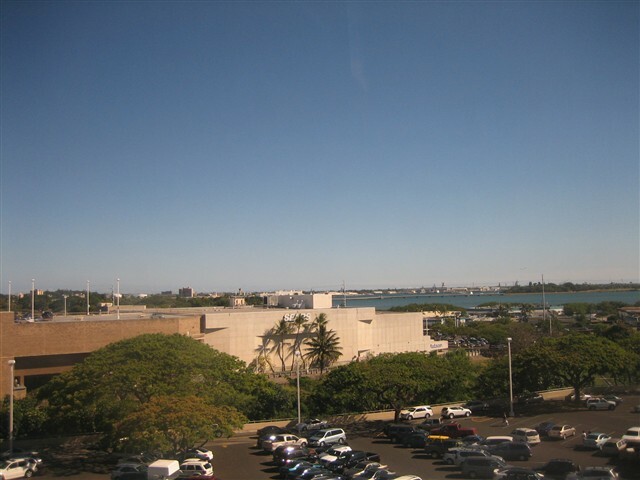 Located just off the H1 freeway near the mouth of Pearl Harbor, Pearlridge Center sits on top of a hill, amid a long string of strip malls and big box along Highway 99. So why’s the mall interesting? I can think of at least three ways. First, Pearlridge is split in two and the halves are discontiguous. They’re in two entirely separate buildings. 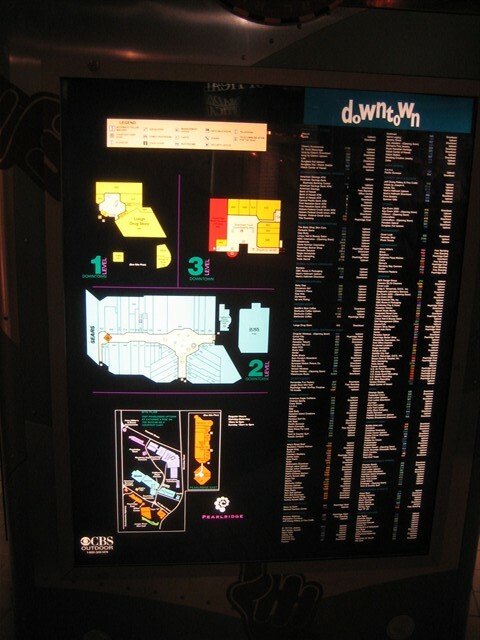 The building closest to the highway is called Downtown and anchored by Sears on one end, and a two-level mall extends to the other end ending at a series of doors. 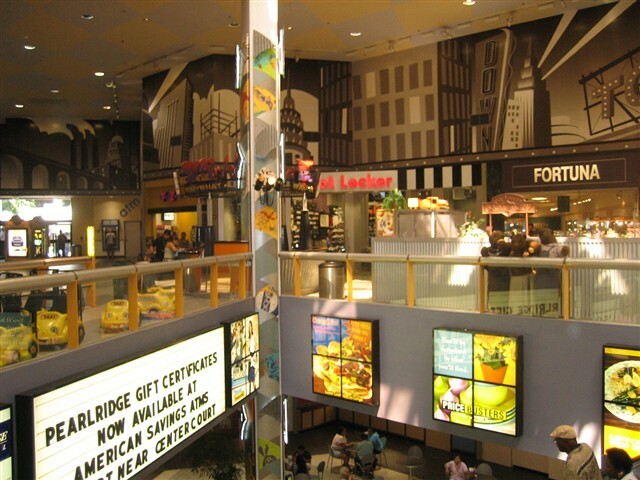 A food court sits in the middle of this section, on a third level above the entire mall. It’s connected by escalator into the rest of the mall and the third level only exists for the food court. The other building’s mall is similar and called Uptown, though Uptown is anchored by Macy’s on one end and Price Busters (Think Family Dollar, Dollar General) on the other end. What else? Well, the mall’s parking structure in the mall building closes to the highway, called Uptown if you were paying attention before, has a large parking structure attached to the FRONT of it. An entrance to the mall is inside, but instead of taking you right into the mall, it takes you into a basement court, BELOW the two-level mall. The basement court has Long’s Drugs, and some other services, but is not large at all. It mainly functions as the escalator to take you up into the actual mall. 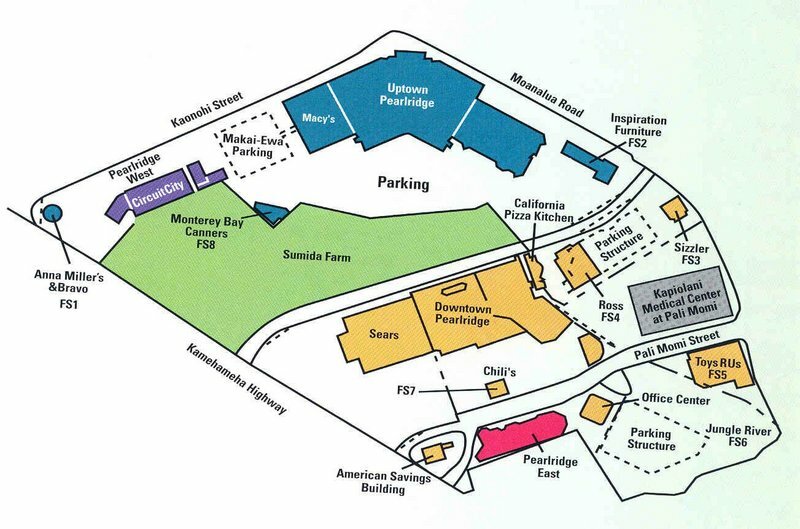 The parking structure extends to at least three levels away from the mall, too. 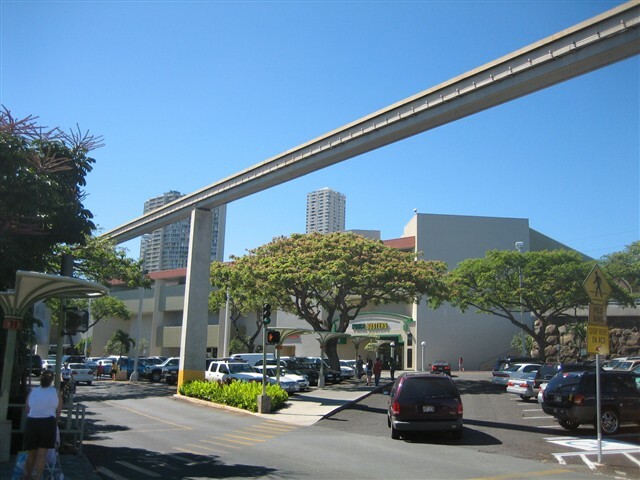 The third special design feature of Pearlridge Center is the Monorail connecting the two mall buildings, Uptown and Downtown. Yes, I saved the best for last. As far as I know, this is the only functioning monorail in a mall in the country, or even the world? I’m not sure. Anyway, this was a shocking, amazingly awesome design feature to find. 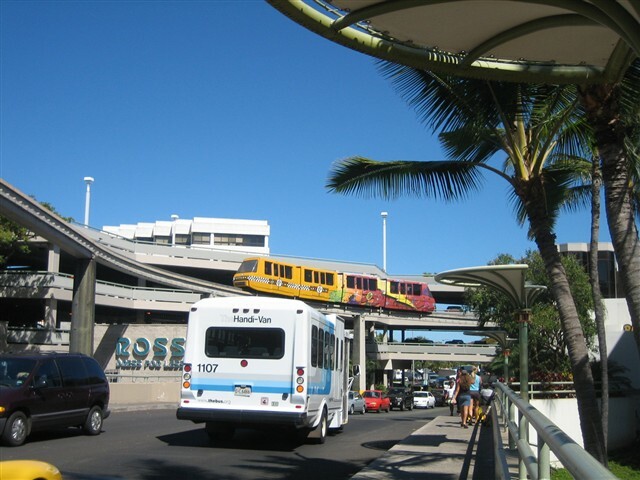 The monorail connects the food court in Uptown with the food court in Downtown. It’s called Skycab, and it costs fifty cents for a one-way trip. I was kind of taken aback by the fact that they charge for this service, when the mall doesn’t even charge for parking, but I’m sure it’s pretty expensive to operate. It’s about a two minute ride (if that?) and the monorail snakes around the corner after leaving each station, crosses the canal made for the nearby watercress farm, and arrives at the other station. Not surprisingly, it’s used frequently by people who want to avoid the parking lot traffic, heat, and blazing sun walking between the two malls. It also effectively makes the two food courts one. So what about the mall itself? Well, aside from the aforementioned anchors, Pearlridge Center is a pretty standard, modern decor. 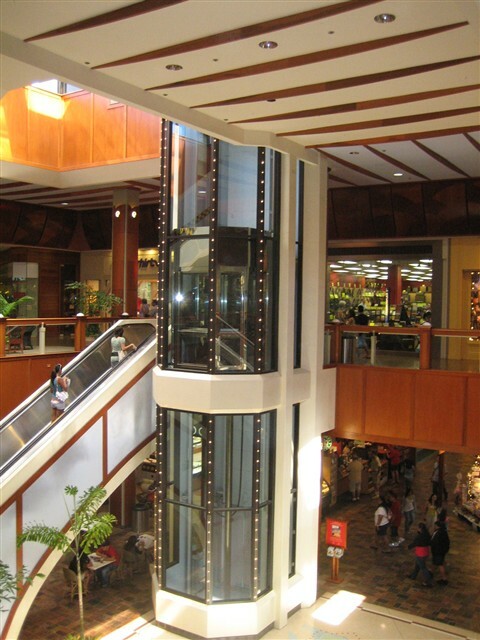 Being the largest enclosed mall on Oahu and the center of retail for all of western Honolulu, it has all the standard national stores and some local ones too. It’s very well kept up and always packed. This is a very popular place. However, the fact that the mall consists of two totally separate buildings and they connect by monorail makes this mall five stars. Go to the mall’s website for more info. Pics taken June, 2006 by me. Just wanted to say thanks for these pics…I lived in that area as a child, and although I can’t remember it well enough to recognize too much in these pics, I’m sure my parents will get a kick out of them. Thanks! Actually, there is at least one other mall with a monorail in America. Westlake Center in downtown Seattle serves as the southern terminal of the Seattle Center monorail line, although in that case, the monorail predated the mall by more than 25 years. Whoa! A mall in two buildings? A monorail? A watercress farm? Is Uptown more upscale than Downtown? Wow. I went to Hawaii back in 2004. I remember checking out this mall. The Skycab/Monorail was pretty cool. I’ve worked there for many years and your article states that Uptown is anchored by Sears. It is the opposite. Uptown is where Macy’s and Pricebusters is, and Downtown is where Long’s and Sears are. Thought I’ld pass the correction to you. We don’t want to confuse anyone. Good catch; it’s fixed. Funny that it was up for two years and no one else caught it. I know of another mall that had a monorail. When Fairlane Town Center in Dearborn, MI opened, there was a monorail that connected the mall to the adjacent Hyatt Regency hotel. It operated for several years but was ultimately removed. Aloha!~I remember seeing the old Penny’s sign with that fancy P and it left a labelscar for ever until they painted it over. A mall with its own monorail…it’s like a dream come true…. 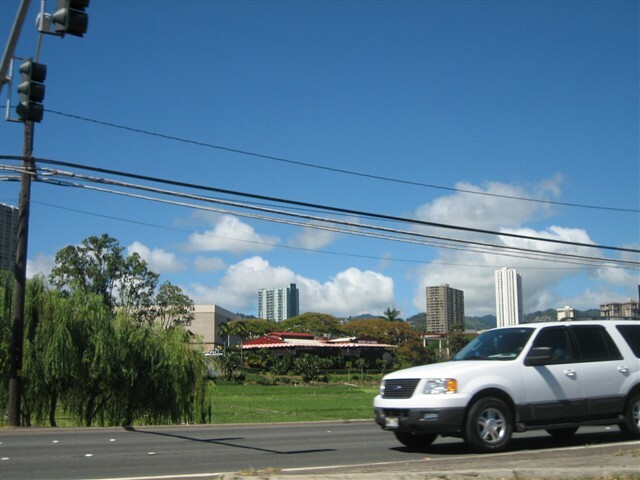 I was living in Makaha when Pearlridge was first being built in the mid-70’s. As soon as the first building opened, I went in and had a pair of glasses made.